I thought I’d conduct a poll (see below) to see what readers of my blog think about legislation to make helmets compulsory. One of the things I like about living in York is that I don’t *have* to wear my helmet when I go cycling. I can just jump on my bike and dash out without having to worry about cycling paraphernalia. It also means I can wear my beanie when it’s cold or wear my hair tied back. 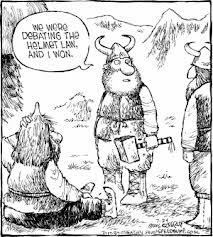 Today I have been having a discussion with members of my family about mandatory helmet laws. They think that if I have an accident while cycling and end up with a head injury which could have been prevented by wearing a helmet, then I should have to fork out the cost of my medical expenses. I disagree with this view. I don’t think that people who smoke should have pay their own smoking-related health expenses, or people who drink should have to pay their own alcohol-related health expenses. Nor do I think that people who eat too much and exercise too little should have to pay their own health expenses. Nor do I think that people who eat too much red meat and end up with a dietary-related cancer should have to pay their own chemotherapy. Do my readers think they should? The other obvious answer is that cyclists have fewer health problems by virtue of the exercise they get. We are fitter and healthier and so less of a drain on the public purse. The benefits of regular exercise far outweigh the risks of not wearing a helmet. It is also not clear that compulsory helmet legislation has any effect on serious head injuries according this paper, Bicycle helmets and the law. The same paper also says that there’s evidence that motorists give greater clearance to cyclists who don’t wear helmets. The conclusion I draw from this is then that it’s safer for my children (who ride on the front of my bike) if I dispense with my own helmet while they wear theirs. Just so I don’t get accused by the Daily Mail of being a burden on the British taxpayer, I want to disclose that we have insurance which covers my health expenses should I have any. But I can see the headline now: Immigrant – without a helmet – crashes bicycle and puts drain on public health system. Posted in Cycling and tagged bicycle, bikes, cycling, healthcare costs, helmet, helmets, insurance. Bookmark the permalink. Actually, I don’t think you “should have to fork out the cost of my medical expenses” as stated in your blog but rather your premiums should be higher if you don’t intend to wear a helmet. It is a bit like car rego where we are all paying the same fee yet careful, accident free drivers are subsidising drunk, reckless drivers. Is that fair? I don’t think insurance companies distinguish between cyclists wearing helmets and cyclists not wearing helmets. Perhaps someone else knows for sure? I just got a quote from a British insurance company, for life insurance, and they did not ask me whether I wear a bicycle helmet. I thought also that drivers who were careful and had few or no accidents, paid a lower premium. “Rego” or rather car registration is a fixed fee all drivers pay to their state governments in Australia. It is a compulsory third party insurance to cover injuries to third parties. Don’t confuse it with private car insurance for your vehicle which is different. Careful, accident free car drivers pay the same fee as a careless driver who has many accidents. The payouts to accident victims can be enormous, running into millions of dollars for a lifetime of specialised care, and rather than put up premiums to unaffordable levels, the payouts have had to have a ceiling imposed on them. At least that is my understanding. An alternative would be to levy a higher fee on the more accident prone drivers, a bit like house insurance where other factors are taken into consideration. It has nothing to do with saying you are a careless bike rider if you don’t wear a helmet but rather that brain damaged victims are costly to the public purse. It is all about limiting risk. Not wearing a helmet will inevitably affect car drivers’ insurance whether you like it or not. The implication here is that by not wearing a helmet you are being reckless. There is no evidence that wearing a helmet saves you from serious injury, therefore insurance companies cannot discriminate based on hearsay/gut feeling/anecdotes. Helmets only work if you land on your head, which only infrequently happens when you fall off. If you are hit by a car at 30/50/70 mph, an inch of polystyrene with a plastic coating on your head is going to do f**k all to protect your internal organs, bones, face, etc as you get smashed into the windscreen, thrown across the road, or crushed beneath the wheels/against a railing. Perhaps a little melodramatic, and I *always* wear my helmet anyway, but people are kidding themselves if they think a £10 hat is going to save their lives in a collision with a 1 tonne metal box. Completely agree with you, Kit. I have also heard that once a car is going faster than 30mph, a helmet is essentially worthless. Nice crash description btw. I researched this when trying to argue my daughter into wearing a helmet and what I read actually persuaded *me* the other way – reduced visibility, reduced ability to distinguish noise, motorists taking less care because they see you as being more protected. I think it should definitely be the cyclist’s choice. Thanks for your comment, Denise. I am only just researching this topic now as I’ve never been particularly interested before and I’m starting to wonder why Australia and NZ have not repealed the compulsory helmet laws they have. Part of what I read was: parents are lulled by fixated on the helmet issue into a false sense that their child is somehow safe, which takes away the emphasis on ensuring that they have good road sense. So I said I would be happy for her not to wear a helmet if we went out together and she could show me she knew how to ride safely. It was a good thing we did, because through riding extensively together, we found out that she did not know the etiquette of what to do around horses. York is very beautiful. I used to have relatives in Upper Poppleton and we stayed in the city many times when my girls were little. I cant ride a bicycle because of my 24 inch inseam, to short for an adults bike to long for a youth. They do make custom ones here but not wiling to put out 800 bucks for a bicycle. I think it up to the individual, except for minors. The law in this state is up to 12 I believe have to wear a helmet. Phew. Definitely agree with you on this one, Bob. When one drinks or smokes one pays taxes (high taxes), some of these taxes are destined for health (at least that’s what the govt claims), whereas a cyclist doesn’t pay a direct tax, but of the income tax one pays some is destined for health. So I agree one shouldn’t pay for ones treatment, because you are already paying. I had forgotten about the high tax on cigarettes. They also tend to pay more on life insurance premiums. I know that is one question they usually ask when you buy life insurance: do you or have you ever smoked. The same research also shows that motorists give greater clearance to women. So many be should make caps with fake pony tails and pink rain coats compulsory. I voted I don’t know. I probably would have voted YES if I hadn’t read your view and and comments. I’m pretty safe on my stationary bike although I’ve tripped over the pedals…….using the vacuum sweeper. Yes, exercise bike when it is too warm or rainy to walk outside. Have you seen the invisible helmet? If the helmet is invisible motorists would still keep a distance. So that may actually be a helmet that improves safety. Until you make them compulsory and motorists count on cyclists wearing an invisible helmet. It’s a pretty cool helmet, I do agree, and probably works better than the traditional variety. It’s 399 euros though so I can’t imagine they’d make them compulsory. I just found an interesting paper, Evaluation of New Zealand’s bicycle helmet law (http://www.ncbi.nlm.nih.gov/pubmed/22327159). Compulsory bicycle helmets were introduced to NZ in 1994 and since then rates of cycling have plummeted and there has been a 20% higher accident rate. Yes this is another factor I remember in my research now! Basically in nations with more cyclists it is much safer to cycle then in nations with lower numbers. So anything that discourages people from cycling makes it more dangerous for those that are left. At least NZ is starting to discuss their helmet law. From what I hear it was started by the world’s most emotive campaign that involved a grieving mother pushing her highly disabled son to every school/committee/council/parliament in the country. The son had (of course) become disabled through a bike accident as a child. She was known to kids as “the cycle helmet lady”. i don’t like them as they give people the perception that cycling is a) sporty and b) dangerous. This stops people getting on their bikes and worse stops their kids getting on bikes. Cycling can be both these things (see http://www.youtube.com/watch?v=7ZmJtYaUTa0&sns=em) but it doesn’t have to be either. Fantastic interview with Paul Steely, thanks Alex. Kim Hill is always good to listen to. I can’t believe that interview was on today! What a coincidence. And that Martyn Ashton video…OMG! He’s amazing. Although I have to say that I hope Daniel never tries any of those things. Martyn Ashton has inspired me to commute home over the bridle path occasionally on my road bike 🙂 Who needs a mountain bike to go off road? I remembered that when I was 10 I’d ride anything anywhere so what’s changed? Well he did give me some ideas for how a cyclist might get over the Auckland bridge which is currently banned to bicycles. Most of us cannot afford a £10,000 mountain bicycle but I don’t imagine I’ll be taking my bakfiets off-road anytime soon. I bet the Bridle path is beautiful. Nice views? People who engage in sports, DIY, driving cars, go to sea, walk about, go up stairs, live in the city, have pets etc etc. Then again, adults should set an example. In the end its about personal choice. However, when it became compulsory to where a motorcycle crash helmet I resented it, but feel differently now. Hmm, I have a feeling the evidence in favour of wearing helmets when riding motorcycles is quite strong. But I could be wrong. I agree that it’s personal choice. I also think that if government’s are really concerned about the safety of cyclists, then the best thing they can do is to build good infrastructure for cycling and encourage a culture of cycling as a “non-sporty, non-risky” thing to do. At the end of the day, it is about being able to afford the best possible treatment for all road accident victims through third party insurance and at the same time not gouging the motorists who pay for this. Perhaps cyclists should be licensed also and this revenue could go towards more dedicated cycle paths and care of accident victims? But that’s another subject. If you are not sharing a road/path with motorists then I don’t think a helmet is necessary, if you ARE then I think helmets should be compulsory. It’s really easy to chuck on a helmet, I do even when I’m just cycling 3 minutes down the road. I put a helmet on when I jump on a horse, I buckle up when I get in the car. These simple actions (that take no thought and less then a second) could make all the difference. They could be the difference between having a headache/mild concussion to being on life support, to losing the ability to eat/talk/think. I’m speaking from experience here too. I’m not sure about insurance premiums, that’s not really the issue I think, The issue is that if you have an accident, even a small one, and you hit your head on a rock… the consequences are absolutely devastating. Sure, for the individual it might be a no-brainer. But for society, compulsory helmet laws have the effect that fewer people cycle. This then makes cycling unsafe for the cyclists who are left. Governments, especially the one that leads the fattest nation on Earth (Australia), ought to be doing all they can to encourage cycling. Encourage people to wear helmets, that’s fine. Just don’t force them to. The other thing is that I don’t ride particularly fast. Sometimes I have even had joggers overtake me. Should these joggers wear a helmet too since they are going faster? What about fast walkers? It is probably safer for all of us to wear helmets for the duration of our lives for walking up and down stairs and running and jumping. Personally, I think this is a bit unnecessary. Why then do you put your children in helmets if you don’t believe they are necessary? I’m actually more worried that the bike might fall over to one side and as the kids are inside a box and can’t put their feet down, they would hit their heads. It’s definitely a high possibility. Well, if your kids were to ride independently of you, and the “box”, on their own bikes, you wouldn’t put them in helmets? Yes I would put them in a helmet. That’s my choice. Children have more accidents especially when they are learning to ride. Oh, and perhaps some motorists do give you a wider clearance to unprotected cyclists, but that doesn’t account for all of the idiots on the road. Liv, If everyone were to tear around the countryside without a helmet, our C.T.P. premiums would go through the roof! I’m not in favour of a Nanny State but this is something that affects us all. Eve — if we had tougher drink-driving penalties and got drunks off the road, our CTP premiums would go down considerably. Some people are serial offenders and allowed to be so because of our crazy tolerance of people who drink and drive. If we insisted on better training for everyone going for a driving licence, accidents would be reduced. If we had better roads and dedicated cycle paths, our CTP premiums would be less as there’d be fewer accidents. Well, Bron, personally, I’d love to cycle around without a helmet. If Boris Johnson can, why can’t I? But even Rachel admits she chooses to put her own children in helmets. At the back of my mind I know there is a need to protect reckless 17 year olds who think they are immortal and the thought of their colliding with a recidivist, drunken driver that our pathetic sentencing system allows to still hold a licence means I support the wearing of helmets. Wasn’t it a lobby of surgeons after all who made it mandatory in New Zealand? They should know a thing or two, surely? Of course, I’d love more cycle paths, higher standards for motorists, tougher sentencing, more money to do all this…….in an ideal world……but it is not ideal world which is why at the moment, helmets are compulsory and our CTPs never come down. Maybe in the future, it needn’t be and in the meantime anyone over 60 should not have to wear one. In some countries in Europe, such as the Czech Republic, there is zero tolerance. That is, you cannot drive with any alcohol whatsoever in the blood. Great idea! helmet debate posters here, as elsewhere, often seem to misread the question of ‘should helmets be compulsory’ as ‘do you personally prefer to wear a helmet’. Expressing a personal preference is not the same as proposing a valid argument for making everyone else do something. I don’t understand why people feel that what they like to wear should be made compulsory for everyone. The logic of so called safety arguments never seems very sound either. Around 100 cyclists die in the UK every year, compared to 400 pedestrians killed on Uk roads annually, over 1,000 occupants of motor vehicles and all of these figures are overshadowed by the 4,000 people who suffer fatal accidents in their own home. Nobody proposes that it should be mandatory to wear a crash helmet to cross the road, drive a car, or climb a flight of stairs although if helmets were as good as they are claimed to be this would save many more lives than a bike helmet law, particularly as a fall in the home is more likely to be within the design tolerences of a bike helmet than the motor vehicle collisions which account for almost all cycling fatalities. if someone thinks a helmet makes them safer, fine. Nobody would ever argue that it should be illegal to wear one so please reciprocate and refrain from arguing that it should be illegal to not wear one. Thanks for your comment NorthernBike. Sometimes I think we’ve all gone a bit safety nuts. I once requested to my local council that they plant a few trees around my local playground. I even offered to pay for the trees. They said no they couldn’t because the trees posed a risk from falling branches to children at play. I have heard that in America, children’s playgrounds are very boring because playground designers have to “make them safe”. Yes but we do keep striving to make cars safer for the occupants, abs, air bags, seat belts. The kind of studies on whether helmets protect from head injury are never going to be acceptable to pure science because you can’t conduct a controlled, like for like comparison without putting real heads in identical collisions with and without helmets. The next best thing is what has been done by comparing head injury severity and outcomes by looking at hospital statistics. In all the literature I can find the minimum improvement is around 60%. The wearing or not of a helmet is not even close to the top of the list of why people don’t ride bikes, I wish people would put their energy and time into lobbying for the things that would get people on their bikes. I must say that I’ve wondered what good those flimsy looking helmets would do in the event of an accident. It would make more sense if legislators actually decided to create proper cycling infrastructure that would separate traffic from cyclists. That would save a hell of a lot more money. People would feel able to get around on bikes without risking their lives. I’m sure this would see a lot more cyclists around. We’d have a healthier society and nowhere near as many injuries or head injuries caused to cyclists by cars, etc. Car registration costs would go down. It would be all good really. Thanks for a thought-provoking post, Rachel. Helmets are only useful at low speeds. When cars are driving faster than 30mph, they are completely useless. In fact, the quote I make below in response to Liv says that helmets are only effective for simple falls at 12mph. I agree that the discussion about safety for cyclists should be around infrastructure and not helmets. Thanks for your comment. I didn’t realise this was such a contentious topic! I really should be studying but one last comment… I am speaking from the point of view of someone living in Australia, where motorists take up all of the road, have no respect for bike riders, and there are very few cyclist-only paths. (This may be a very different story in Europe). The emphasis is on sharing roads with motorists. It’s not how fast or slow you are going Rach, it’s the motorists that make helmets necessary. If people truly have stopped riding because they don’t want to wear a helmet …. really, fashion sense and vanity over life? It is just so simple. We all have to wear seatbelts, can you really say that we should make that optional? I’ve seen head trauma first hand,I would not wish that on any human being. By the way, NZ is fatter then Aus. As is Mexico and America. 🙂 but yes… we are fat! > where motorists take up all of the road, have no respect for bike riders, and there are very few cyclist-only paths. Yes, I agree that this is a problem, but this is a separate issue and cyclists should not be blamed for policies that give preference to cars over cyclists and pedestrians. Whenever compulsory bicycle helmet legislation has been introduced, rates of cycling plummet and it’s not about vanity. It’s because cycling is suddenly perceived as dangerous and sporty and so slowly people start to do it less which has the effect that others do it less and there end up being fewer and fewer commuter cyclists. Motorists then become less familiar with the idea of sharing the road and they see fewer and fewer cyclists so they look out for them less. Arguing that cyclists who do not wear helmets should pay their own medical expenses is victim bashing. A key question is whether legislation leads to fewer people cycling. If this is the case then it is counterproductive: as the CTC point out, the health benefits of more people cycling without helmets are greater than the gain in head injury reduction of fewer people cycling with helmets. As an advocate of better health for children I will urge for measures to encourage cycling and walking in children rather than compulsory helmets which could be seen as victim blaming, unless it is part of a package of measures including traffic calming, traffic reduction measures and separation of cyclists from motorists. I will continue to wear a helmet myself and shall encourage usage locally, but don’t believe the evidence is yet adequate to support population measures , either for children or for everyone. That helmet use has failed to improve reported road casualties is not surprising. A cycle helmet is designed to meet the event of a simple fall at speeds below 12 mph. Such a mild crash is unlikely to incur serious injury when road riding. Safety campaigners are pressing helmets to an application for which they were not intended. The ethics of this are questionable, a point peer reviewers should have highlighted. The use of helmets is more relevant off-road or “at play”, stunt riding on BMX or MTB type machines. The use of helmets in such situations is perhaps to be encouraged, although parental supervision should come first. On the other hand, these comparatively high-risk activities are the consequence of children being denied the freedom to cycle for transport. Riding sensible road bikes on public streets either is, or ought to be, a safe mode of travel for children, not rationally to be distinguished from walking. As to that cycling plummeting when people have to wear helmets issue, Rach, cycling is so popular these days that I doubt that that is still the case. It is not just about vanity. It is also about a higher risk of being in an accident with helmet. And bikes are often used in commuting, for example, driving to the railway station and other short trips. If using a bike means you have to drag a bulky helmet with you all day, you may forgo such trips. That’s a good point. People who commute to the station or to work will be leaving their bike there all day and they don’t want to have to carry a helmet around with them everywhere. Who wants to go and buy a helmet just so you can rent a bike for 30 minutes? I didn’t ever say anything about cyclists paying for their medical expenses…? In fact I actually said that medical expenses/insurance wasn’t the issue. … I just followed the link to your article, it is pro-helmet wearing? Anway, we will clearly have to agree to disagree. As a nurse, I am very glad that they are compulsory in Australia. Yes that paper is pro-helmet but it has flaws which are outlined in the two published criticisms of it and which I quoted from. The published criticisms are on the same page. I would have thought that a nurse would be glad to have policy that improved the general health of the population so perhaps we should just disagree on this one. Another good analogy here might be should people be forced to wear a hat and sunscreen when out in the sun? Encourage them, yes, but make it mandatory, no. In the UK the issue would be to forbid people to use sun screen as they are getting much too little sun any way, at least in spring and summer. It is a good example, as it makes the point we should stop micromanaging everyone lives, only make laws if something is very important and the scientific evidence for improvements is strong. I had wanted to write “especially in spring and autumn”. In summer sun screen may make sense, especially for people who got too little sun in spring. According to information on an Australian cyclists’ action group web site (which may or may not be credible) the move to introduce cyclists’ helmets was spear-headed by the Royal Australasian College of Surgeons. This was claimed to be just another case where medical practitioners advocated something from “vast personal experience”, with no statistical evidence in support. From there, helmet manufacturers and retailers took up the claim enthusiastically, sensing money to be made. I have often wondered how cyclists helmets are supposed to work. Those of motorcyclists look like they might protect heads. On the contrary, strapping a lump of polystyrene on the top of a cyclist’s head, like a serving of mash potato on top of a steak pie, doesn’t actually look to the uninformed observer, such as me, as though it will be of any help at all. In fact, if a cyclist lands diagonally on his head, the additional helmet height may increase the rotational moment of his skull and exacerbate damage to his brain. * Whether helmets’ contribution to safety (if any) is outweighed by the negative message sent that cycling is “dangerous”. If we knew these things we would know what to do. I think that there probably is crash testing of helmets. I had a look and found http://www.smf.org/testing and http://www.sciencedaily.com/releases/2013/06/130613092421.htm. The second link finds that helmets do give a benefit in the event of an impact to the head but this was testing forces against a helmet on the dummy. 1. What is the effect of a public health policy that requires helmets? 2. What is the effect of wearing a helmet? My conclusion from this paper is that there is minimal benefit in terms of the policy question but perhaps a small benefit to the individual. But even in the case of the individual, they outlined a few problems with these research findings. But all those riders in the Tour de France wear them….. are you suggesting it is just a fashion trend supporting a lucrative bike helmet manufacturing industry? If a bit of cardboard egg carton can protect eggs, Mike, then perhaps a bit of styrofoam wrapped around heads prevents skulls being reduced to bags of shells in an accident. More recently, this in the SMH http://www.smh.com.au/executive-style/fitness/blogs/on-your-bike/share-bike-schemes-need-to-lose-the-lids-20120920-267wg.html, suggests that the Brisbane cycle scheme is not nearly as popular as its counterparts overseas and that helmets are part of the reason. I walk one of the bike paths everyday and have noticed a rapidly growing popularity compared with when it was first introduced. I can’t compare our scheme with overseas schemes but after all they have been going much longer. You can also link your account in with Facebook – I think. It’s been a while since I hired a bike although I’m a subscriber to the scheme which has many progressive marketing ideas. Wow Rachel, this certainly got some attention! I’m just now catching up. I will admit that my first thought was well, yes, I think that helmets should be compulsory. This is because it was compulsory in California when we lived there and so my children all wore helmets, as did I, because we were told to, it was the law and that was that. No choice in the matter. I just assumed that it was safer and more responsible to do so. When we returned to the UK in 2003 I was shocked to see kids out on the road riding their bikes without their helmets on, assuming it was also law here. My children stopped riding their bikes once we moved here (sadly) and so I didn’t think much more about it to be honest and didn’t research it, but reading here I’ve found it all fascinating. As a result of what I have learnt here, I would have to vote that it is up to the cyclist. I always give a good birth to cyclists, whether or not they have a helmet on so I’m amazed to read that apparantely motorists give a wider birth to cyclists if they aren’t wearing a helmet! I will just add too that I think it’s wrong to expect someone to pay for their medical care if they aren’t wearing a helmet when they have an accident. As you so elequontly write here, where then would we draw the line as to who should or should not pay? I too share your wow at the amount of attention this post has got. It is a more contentious issue than I first thought. I grew up in a place where helmets were compulsory and so it is not something I ever questioned either. But living somewhere else and seeing different rules has made me rethink it and I have changed my mind. But I didn’t realise my view would generate the “victim blaming” that it has done. I too don’t think that cyclists should be blamed for not wearing a helmet should they have an accident. Ps Meant to make it clearer – up to the cyclist, as an adult, but compulsory for children. That is how I will vote. The ethical problems associated with legislation prohibiting adults from cycling without helmets are relatively obvious. First, John Stuart Mill’s “Harm Principle” suggests that we should not interfere with competent adults who wish take risks with their own health. Second, even if we do not always agree with the letter of Mill’s “law” we still have sound liberal reasons to avoid paternalism unless the risks we wish to prohibit are significant and unless there is a highly effective way of reducing them with little infringement of liberty. Of course, some will argue that cycle helmet legislation conforms to these latter requirements. However, it is not clear that helmets provide sufficient protection to warrant the claim that they are highly effective and, as a keen cyclist, I would argue that the right to cycle bare-headed is by no means trivial. I concede that cycling “sans helmet” will lead to higher costs to society in some situations. This is because a number of non-helmeted cyclists will require medical treatment following cycle accidents which they would not need if they always donned protective helmets. However, the total costs involved here are dwarfed by the costs generated by those who smoke, drink excessive amounts of alcohol, eat unhealthily and fail to exercise regularly. As such, it seems mighty odd to create legislation prohibiting people who are engaged in a healthy activity from taking a relatively small risk of creating a relatively small cost while allowing other people to engage in highly risky activities that will generate enormous social costs. Indeed, the whole thing smacks of discrimination against the cycling minority. So where does all this leave us? Some will read the above and continue to advocate mandatory cycle helmet legislation. It is hard to know what to say to such people other than to ask them whether they would also agree to defend a compulsory pedestrian helmet law. This might seem like nothing more than a bad April Fools’ joke. However, thousands of pedestrians are injured and killed each year and many of those who suffer the worst injuries do so because of head trauma. As such, pedestrian helmets could make a real difference to people’s health and significantly reduce healthcare costs to boot. Perhaps a very committed helmetologist will claim that a pedestrian helmet law is justifiable. Indeed, the logic of the helmetology argument seems to commit advocates of mandatory cycle helmet legislation to exactly this conclusion. But I imagine that most readers would join me in resisting those who would want to give us all a bad hair day, every day. If anyone is interested in the case for helmets for walkers, it can be found here – http://www.bmj.com/content/321/7276/1582 – under Safe Waking. I can see that this is something you have made your mind up about, and that you are unlikely to consider any contradictory response or evidence however, since you chose to blog about a debate which I was primarily involved in, after taking it down, I thought I would respond. I think Rachel, that you have selectively edited the debate we had the other night. I am concerned by both the financial, but MORE SO the human cost of head injury. There are multiple studies which show that helmets do provide protection for cylcists regardless of age. If your argument that you should have the right to choose whether to wear a helmet is loosely based on one Canadian study, done one year after compulsory helmets were introduced, I will add below links to several international studies with large sample groups, good controls and long term results which show that helmet-wearing decrease both morbidity and mortality rates. The other issue which I think is important to point out is that my very first point was – go helmet free if you want, but not on roads shared with motor vehicles. There is strong evidence to show that head injury rates are decreased by helmet wearing regardless of the cause of the accident, but it is far more singificantly reduced in the case of crashes involving motor vehicles. For the sake of your cold head, buy a second, bigger helmet to accommodate your beanie (this may decrease the effectiveness of the helmet, but not to the extent that you would be better off without the helmet) and for your tied back hair, try a low ponytail. For the problem of inconvenient paraphernalia (AKA safety equipment) when not in use lock it on your bike or put it in the front section of your bike. You also say your kids will be wearing helmets, two questions: Why is it not important for you to show an example and wear one yourself? and Why do you think they need to if you don’t? Nobody said don’t exercise, just do it the safest way you can. I wear sneakers with reflective tape and bright colours when running. I could choose not to, but whether it was the law or not, I think my health and well-being is important and so I do. I wear a helmet when I cycle and I make sure my kids do too, when cycling, skate-boarding, scootering etc. I wear knee pads and elbow and wrist protectors when roller-blading. I just don’t think it is too much effort. “Bicycling accidents cause many serious injuries and, in the United States, about 1300 deaths per year, mainly from head injuries. Safety helmets are widely recommended for cyclists, but convincing evidence of their effectiveness is lacking. Over one year we conducted a case-control study in which the case patients were 235 persons with head injuries received while bicycling, who sought emergency care at one of five hospitals. One control group consisted of 433 persons who received emergency care at the same hospitals for bicycling injuries not involving the head. A second control group consisted of 558 members of a large health maintenance organization who had had bicycling accidents during the previous year. We found no randomized controlled trials, but five well conducted case-control studies met our inclusion criteria. Helmets provide a 63 to 88% reduction in the risk of head, brain and severe brain injury for all ages of bicyclists. Helmets provide equal levels of protection for crashes involving motor vehicles (69%) and crashes from all other causes (68%). Injuries to the upper and mid facial areas are reduced 65%. To the last respondent, pedestrians do not, in the main, share their walking paths with motorised vehicles. Kelly, the three links you refer to are all from the same three authors and are case-controlled studies, which if you have a look at the article I refer to in my post, have some problems. These studies, however, are vulnerable to many methodological shortcomings. If the controls are cyclists presenting with other injuries in the emergency department, then analyses are conditional on having an accident and therefore assume that wearing a helmet does not change the overall accident risk. There are also confounding variables that are generally unmeasured and perhaps even unmeasurable. People who choose to wear bicycle helmets will probably be different from those who ride without a helmet: they may be more cautious, for example, and so less likely to have a serious head injury, regardless of their helmets. You imply in your first sentence that I am biased and immovable in my position. I think it’s worth mentioning that I used to think as you do, that helmets should be compulsory. But having lived in other places around the world where there is a culture of commuter cycling, I have changed my view. Lots of people cycling around York do not wear a helmet. I even saw a child cycling to school this morning without a helmet on. I did not take it upon myself to point my finger at his mother in blame as I think it is better to see children cycling to school than sitting in the back seat of a car while their parents drive them there. My children have also once ridden home in the bike without a helmet on because I forgot to take them with me when I went to pick them up. I am pleased that no-one fined me for being forgetful. It is true that there are lots of off-road cycle paths here but everyday I do need to venture onto roads as the cycle paths do not cover the full distance. It would be very annoying to wear a helmet for the 5% of the journey on-road, then stop and take it off for the rest of the off-road journey. Australia and New Zealand are to my mind, the worst places in the developed world for commuter cycling and I think compulsory helmet laws are partly to blame. Both places saw the number of cyclists on the road plummet with the introduction of this legislation and New Zealand saw an increase in the rate of accidents. It may be true that pedestrians are mostly on footpaths – although they do have to walk on the road to cross it – but the rate of accidents for pedestrians is higher than for cyclists. Because of this, it’s my view that if you want compulsory bike helmets for cyclists, then you should also argue in favour of compulsory helmets for pedestrians as well. Lastly, I hope that should I have an accident and require treatment, that the health professionals who meet me in the emergency department will not point the finger of blame at me for cycling without a helmet. I wholeheartedly agree with Kelly! The voice of experience and she has also raised a point I was thinking of myself today – it sets a bad example for your children when you dont wear a helmet. No doubt, when they are wilful teenagers, helmets will be discarded the moment they are out of your sight. Regarding accidents for slow moving pedestrians (who naturally cover less ground by virtue of their slower pace) versus those for cyclists, can we have some percentages instead of absolute numbers given in several places above by you and others? Absolute numbers are meaningless. There are many more pedestrians than there are cyclists. Finally, did you look at my link to helmets.org above? This non-profit group from Washington has been promoting bike safety and helmet research and advice for decades now. Their website is impressive and the technology that goes into helmets today is amazing. Why reject it? I know, you’ve just spent several hours telling us that. The human skull is not very thick, only about a quarter of an inch, less for children..
What happened to “I don’t like the nanny state”? Or is it just that you couldn’t possibly ever agree with me? See my reply to Bron above, posted last night, which encapsulates my views. I am torn between various points of view. Perhaps helmets.org changed my mind a bit. Besides, I don’t have young dependents, just a couple of cats and a dog. It doesn’t matter if I crack my skull. For the benefit of readers here, the article I link to in my post is not to one isolated Canadian study, but is an article written by Ben Goldacre a British physician, academic and science writer. He is also a research fellow in epidemiology. His article looks at all the current research in the area of bicycle helmet effectiveness or not, including one of the pro-helmet ones Kelly links to above. It is very recent, June 2013, and very good. There is also a good collection of research, both for and against mandatory bicycle helmet legislation at this site : http://www.cyclehelmets.org/1157.html This site appears to be against compulsory helmet legislation, but they do provide a good summary of research papers on the topic from both sides. So your view was movable, but now is not? I wont change my view either, as I know what the consequences are from emergency medicine through to rehabilitation. Brain injury is catastrophic to independence and life quality. In the event you did have a cycling accident, health professionals would be doing everything to save your life, and reduce the post-injury deficits you may have, not pointing fingers. I wouldn’t either, I would be, and I think most health workers would be feeling very much for you and your family. There would be, at some point, the thought that if you had worn a helmet you would be 66-80% likely to have a much less severe head injury, THATS ALL. I wouldn’t expect anyone would be pointing fingers at other parent’s choices, just making sure they did the safest thing for their own kids. The studies don’t consider other injuries because they are looking at the efficacy of helmets in preventing head and facial injury, other injuries are, in the main, non life-threatening and not affected by helmet wearing. Also a great idea for a beanie helmet, I reckon with your creative skill and crocheting ability you could make something beautiful and practical, maybe even a best-seller in cold climates. Lastly, I have put a link to an article which argues that there are other issues that are far more important to tackle if the main aim is to increase bicycle use. It clearly shows that laws or not, helmet wearing, or not, isn’t what affects the number of journeys undertaken per capita, per country. I would certainly join in the movement, and use my energy to support these, rather than argue about helmets. I would be joining the relevant lobby group or party who are advocating for and doing something about the things that really deter people from cycling, for example the newly formed Australian Cyclists Party. I just might, and I will keep wearing my helmet. Thanks for making me think more about cycling, but on the issue of helmets we’ll just have to agree to disagree. The Crikey article is good and I largely agree with it. I think introducing mandatory helmet legislation in Australia and NZ was a big mistake but I’m not sure that a repeal of the law will solve the problem. There is no culture of cycling in either place. It is seen more as a recreational activity and I can see from this discussion, that it is seen as something quite dangerous and it probably is. The situation is very different here (in York anyway). It’s not uncommon to see someone cycling in a dress and high heels on their way to work. It is commuter cycling here rather than recreational cycling. The bikes are different too. I can put my feet flat on the ground when I’m not cycling and I sit upright rather than hunched over the handlebars. I’m not sure how to change the situation in Australia and NZ but the first thing to my mind would be to stop handing land over to motor vehicles. The opposite should be happening: land taken away from motor vehicles and given to pedestrians and cyclists. This will be very difficult though given that the new Prime Minister is so intent on building more roads. Incidentally, Rachel, when you did that solo bike trip between Antibes and Monaco (in your twenties) did you wear a helmet? To be honest I don’t remember. Probably. I do remember feeling fairly exposed on those narrow winding roads and I thought of Grace Kelly and her car crash there. I’m pretty surprised that motorists currently receive stricter penalties for speeding than for killing or injuring cyclists. I also agree with Pedal Power lobby group calling for cyclists to be able to cycle across pedestrian crossings. I can’t believe they can’t already!!! Speed-limited traffic is a very cheap and easy way to make it safer for cyclists and pedestrians. York is currently rolling out a city-wide speed limit of 20mph (32km/h). I am all for this and think that any city that is serious about cycle safety should do the same.